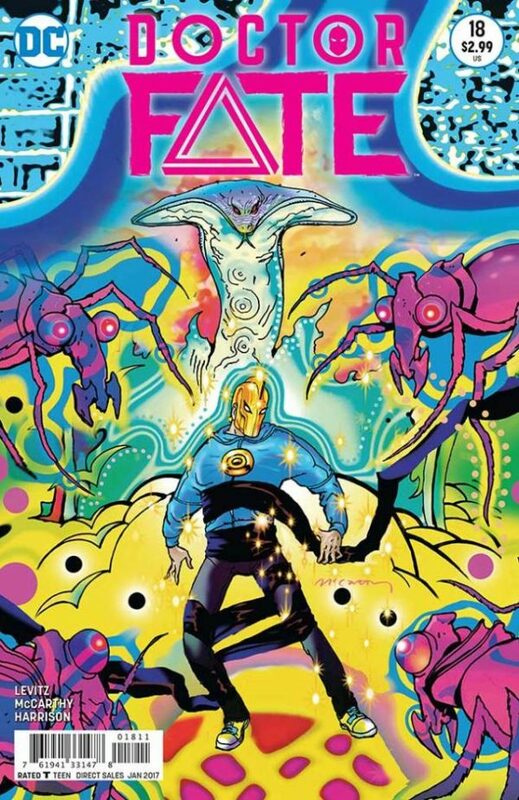 The final issue of this run of DOCTOR FATE is the second half of a two-part story that mostly stands apart from the previous issues, with psychedelic art by Brendan McCarthy and a pretty good story by Paul Levitz. This issue drops us into everything midstream with no recap or explanation. I suspect these issues were intended to be an Annual, but that’s just a guess. The best thing in it is that Khalid finally gets to meet the god who powers his helmet and himself, Thoth. Taking a break from battling evil creatures, Thoth and Khalid have a wonderful conversation about wisdom and free will that’s worth the price of admission. The rest of the issue is fun visually but somewhat predictable. There’s not much sense of closure at the finish, another signal this was not written as a final issue, but in the DC Universe, Doctor Fate will go on to other iterations, so perhaps that’s okay. We can imagine Khalid’s future in our own ways. This entry was posted in Comics, Reviews on February 23, 2017 by Todd.